Much can be criticized with the criminal justice system, but a York, Pennsylvania-area non-profit seeks to help criminals and addicts with a hand-up not a hand-out. Life’s Beacon Foundation provides a safe place for men leaving prison or rehab to make real and positive change in their lives. The organization recently launched a new website through a partnership with local website design firm CourseVector. The site features success stories, program details, and a donor portal. Founder Robert Allen, a self-professed “ex con gone good”, went to prison in the early 90s on voluntary manslaughter charges. He spent close to 10 years in jail where his whole life changed. He started providing seminars in prison to help other men like himself, who truly wished to change. Allen stared Life’s Beacon Foundation from his prison cell; with the help of his father. His hope was to help restore human dignity by helping those struggling with alcoholism, addiction, and other issues that lead to a life of crime. Life’s Beacon is a structured, life skills home for men who are truly ready to help themselves. “Life’s Beacon Foundation will give understanding to those seeking a second chance in life. We will respect the dignity of each individual, no matter how low that they have fallen or what position in life that they find themselves,” states Allen. The home allows men 18 or older to grow spiritually, mentally, physically, and emotionally. The structured, drug-free environment is ideal for those transitioning from parole or rehab. 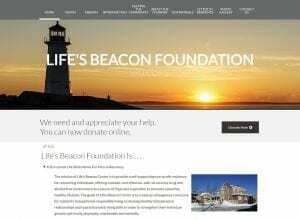 Life’s Beacon Foundation is a not-for-profit organization and relies on donations and community support. Their online donation portal is an important part of the new website, provided free of charge by CourseVector. Donors can now connect with the organization right on the website. While there, donor’s and community members can learn more about the program and hear from some of those whose lives were transformed thanks to Life’s Beacon Foundation. CourseVector produced this website through our Community Services Website Program providing a significant discount to Communities, Organizations, Nonprofits and Churches. Please consider supporting Life’s Beacon Foundation as they continue to provide a valuable service to the community!